3D Angel 4 - 2 Sizes! Freestanding lace 3D Angels to hang on the Christmas tree, these angels can be done in either the 4x4 or 5x7 hoop, files for both hoop sizes included, with step by step photo instructions. The underskirt is fabric lace I bought from the fabric store, you can add different lace, organza, voil or whatever you think would look pretty and dainty. See photos for sizes. Earn 16 points at checkout OR buy this item for 320 points. 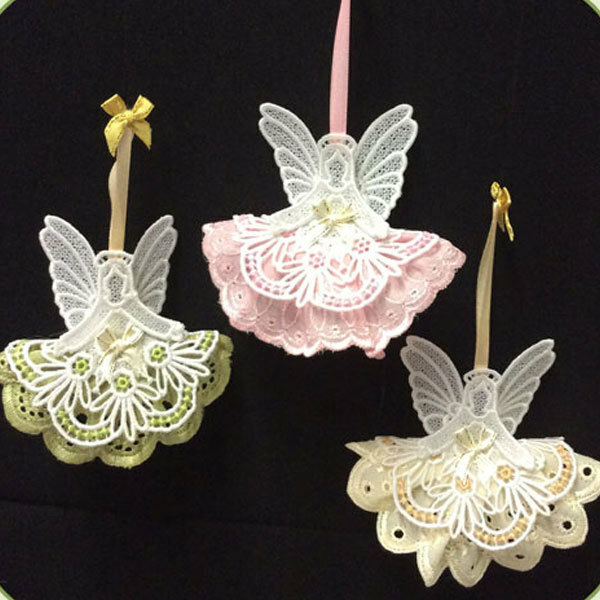 Freestanding lace 3D Angels to hang on the Christmas tree, these angels can be done in either the 4x4 or 5x7 hoop, files for both hoop sizes included, with step by step photo instructions. The underskirt is fabric lace I bought from the fabric store, you can add different lace, organza, voil or whatever you think would look pretty and dainty. 3D Angel 2 - 2 Sizes!